Today, it really feels like summer. It’s hot, humid and sticky. It’s the kind of weather that makes you not want to step into the kitchen, let alone cook a gourmet meal. Therefore, I’m sticking to a cool, smooth, and healthy yogurt and herbs dish for dinner. 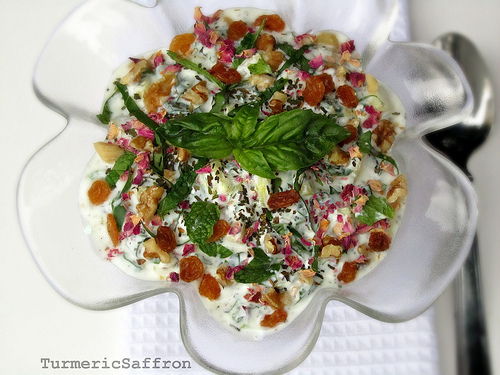 The combination of plain yogurt, aromatic and flavorful vegetables, crunchy walnuts and tasty sweet raisins makes a light and delicious meal for hot summer days. In a large bowl combine all ingredients and mix well. Taste and adjust the seasoning. I just wanted to let you know how much I adore your blog. There are not that many places that I've found that have good, reliable Persian recipes. Your pictures are beautiful! Keep up the great work! Thanks Amy, I appreciate it. I'm going to get back to blogging. There are so many wonderful recipes that I would love to share. Anonymous, salam, baleh Irani hastam.